In production as a Film. Forget the World Wide Web. 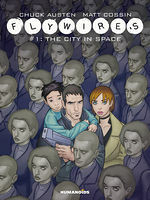 In the future, all aspects of human interaction are done through the Flywire Network. 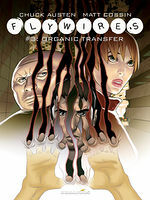 A “Flywire” is an electronic device surgically implanted behind every citizen’s ear that gives them wireless access to infinite libraries of digital information. Technology can finally make our dreams a reality quicker than you can snap your fingers. But is this a gift or a curse? Police officer Kelsey Fontine is forced to retire after his “Flywire” stops working. A disastrous gunfight and failed kidnapping of his neighbor’s kid have him back in the role of “hero.” In a future where technology is EVERYTHING, Kelsey must find a way to save the day without being jacked into the system.